While I firmly believe in the sugar-laden fun of Samhain (hence my annual Treehouse of Horror marathon), I also think it's important to remember the core of this Sabbat—honoring our transcended loved ones. Now, I'm the first person to admit death is one of the shittiest parts—Nay! THE shittiest part— of life. Trust me, you don't want to see me at a funeral. It's UGLY! I'm just a curly-headed blob of tears and Kleenex topped with a touch of hyperventilation. It's quite the spectacle. But regardless of the snot-fest that is mourning, there are ways to honor our loved ones that don't need to be so painfully miserable. Here are 5! Oh sheesh. I could go on for hours about things I learned from my transcended loved ones. The honor of hard work from my Grandpa Raymond. The gift of embracing life with positivity from my Grandpa Mario. Self-love, self-acceptance, gratitude, and compassion from my beloved and sorely missed furry soulmate, Barley. Losing someone who brought you so much happiness is an excruciatingly painful thing. Okay, that's an understatement. It f#@&ing blows, and I don't much appreciate it! I doubt you do either. But it IS part of life. It's the one surefire promise we are given upon our first breath. My Grandpa Raymond loved bird watching. My Grandpa Mario loved music. My beautiful Barley lived to walk, ala Forest Gump. Whether it was crocheting, cooking, dancing, or just having a beer, take some time to remember your loved ones by doing what they most enjoyed! It's a fantastic way to feel connected to them, to remember them, and to ultimately honor them. And while you're doing so, keep an eye out! It's very likely they will send you a sign that they appreciate your nod to their happiness, especially as the veil between the physical plane and spiritual plane thins. ...Or social media. Or on a piece of paper you can tuck away someplace special. Writing is cathartic and can often reveal emotions we didn't know we were repressing. Don't judge your handwriting, your spelling, your verbiage. Just write down what your heart is expressing and reflect on how your loved ones influenced your life. I was two when my great grandmother died, but that doesn't mean I don't miss and think about her. Throughout my life, I've always felt a strong connection to a woman I essentially never knew. And yet, I did. Through the stories my family told me about her, I developed a connection to her and learned we both have a lot in common. Not only did this allow me to feel close to her, but it ensured her spirit would be remembered even after the people who knew her personally are gone. When I think of my Grandpa Raymond, I immediately think of rhubarb. It was one of the stranger things he had in his vegetable garden. I mean, who the heck actually eats rhubarb? But every summer he made rhubarb pies and rhubarb jam. Being a highly picky eater as a child, I never tried either, and I sorely regret it now. My other grandfather, Grandpa Mario, loved food but had to watch his diet after his first heart attack. Well, my Nana watched it. He just sort of went along with it, though he never complained. It just wasn't in his nature to do so. But on holidays he'd indulge and my Nana would pretend not to notice. What was his favorite holiday treat? Without question, chocolate-covered cherries. You see, just like me, my mother was the only daughter. And my mother and Grandfather shared a very close bond (as did he and I!) Every Christmas—Every. Single. Christmas—my mother would give him one individually-wrapped chocolate-covered cherry on the sly. "Don't tell Mom!" she'd warn. He'd wink. And the two would laugh quietly over their nefarious, yet not so devious, secret. The first Christmas after my Grandfather passed, just ten short weeks after his death, I knew my mother's heart would sink every time she saw those individually-wrapped chocolate-covered cherries on the checkout counter (a common thing in New England). When she called on Christmas Eve, she told me her and my heartbroken Nana were toasting my Grandfather with chocolate-covered cherries. "Do you remember how I used to give him one?" she asked. But how could I forget? It was something I looked forward to every year, watching those two giggle like they had just committed a high-risk crime. "I made a batch from scratch," I'd told her. "I'm eating one right now." And so now, every December, I break out the candy molds and remember my dear Grandfather. Food is such a prominent part of mingling and bonding with friends and family. And while you may never have deeply thought about it before, I bet there's a particular food or dish that reminds you of your transcended loved one. Take the time to make that special something this October. It's a way for us to honor and remember them through something that brought them joy. And while you prepare that special dish, think about all the lovely memories you have of them. Dismiss the sad, heavy thoughts. Let go of the what-if's. Forget any painful memories of seeing them ill. They don't want you to reflect on that. They want you to remember their LIFE, not their death. Death is merely a mechanism for moving on to other planes; it's not a defining characteristic of that person's life. Steep yourself in the love, the happiness, the goofy stories, that crazy time Aunt Hilda locked herself out of the house and you pulled up just in time to see her bright yellow underwear as she crawled in through a casement window. Those are the moments they want you to treasure. Those are the gifts they gave us to cherish. Looking for more ways to celebrate Samhain? 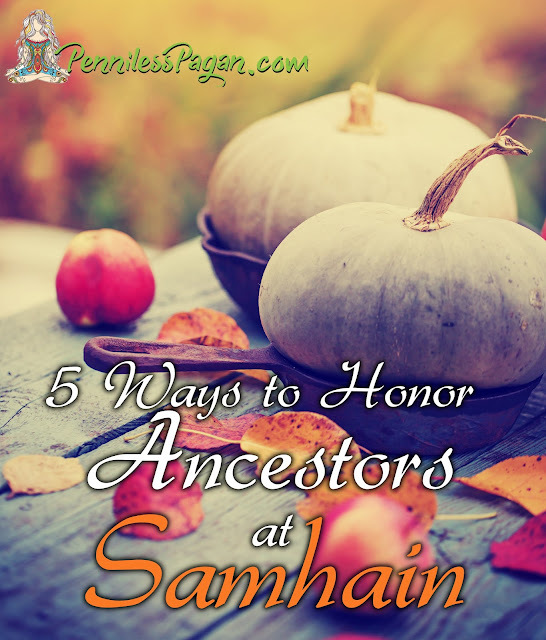 Check out Samhain Traditions: 13 Simple & Affordable Halloween Spells & Rituals for the Witches' New Year! What was your loved one's favorite dish or pastime? My grandparents used to have rhubarb growing in their garden (I actually live in their house now but rhubarb doesn't grow anymore). My grandad used to make really nice chips (fries but the bigger fish and chip type) and my nana taught me how to knit. How wonderful to be able to live in a house steeped in family and memories! ♥ I hope you have a blessed Samhain. Thanks for taking a moment to comment! =D Enjoy those chips! That's lovely that you're making a Christmas blanket for your nana. :) I haven't tried crocething but would like to have a go in the future. Thank you for this! Especially this part : Yes, life comes with blistered memories. Yes, there are things we could have done differently and probably a few things we wish we'd never said. But that's the purpose of us being here—to learn and grow from our mistakes. Departed souls don't hold these lessons against you. They made mistakes themselves! Like us, they were human and bumbled through life.